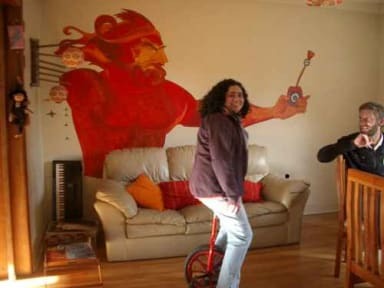 Airesbuenos Hostel is located in the centre of Valdivia just three blocks from the bus station and minutes away from the city's major attractions. e have implemented many sustainable features such as solar powered hot water, central biomass heating, a greenhouse kitchen and more. 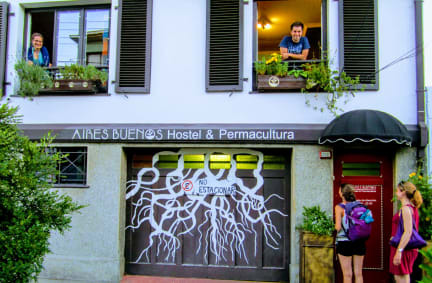 The best part about the hostel is YOU and the diversity that comes from with guests from around the world and Chile. This cozy, three-story hostel, welcomes guests with its comfortable and modern interior design. The rooms are clean and bright, healthy breakfast included with free flowing fresh ground coffee and teas. High speed wi-fi included. The shared rooms have 6 beds and fresh linen is included. There are also five private rooms with bath. We have ample shared spaces for socializing or being alone. It is located just 10 minutes from the bus station. The staff speaks English and Spanish. Fantastic place with lovely staff that was so helpful! That's how I found out about the amazing park on Isla Teja behind the Veterinary Hospital; definitely worth a trip! Aires Buenos is perfect! Lovely host and staff. I liked it so much I stayed a second night. Nice, super clean, spacious hostel with huge lockers. Wonderfully relaxed vibe - friendly if you want to chat but chilled out enough to have your own space and quiet time. My bed was the best I've ever had while travelling. Firm mattress and thick pillow! Wish I could have stayed longer but my next destination was already booked. Thanks for a lovely 2 night stay! Great vibe, friendly staff, clean and stable facilities. Fast wifi is a huge plus too!!! Easily one of the best hostels I've ever stayed in. Super nice style with an environmental consciousness. Relaxed atmosphere; excellent common area and yard. Cooking is right next to a garden where you can grab herbs. One dog and a duck. Staff are very knowledgeable. Owner is hilarious and has good stories. Close to a market. Nice hostel and a super nice outdoor area. Weird that they make you pay if you need to hang around after check out but otherwise cool eco friendly hostel. We took 2 beds in a 6 person mixed dorm. We would recommend, although not if you are looking for a sociable hostel/ party place. Plus points: Bedrooms were spacious. Beds comfortable although a bit creaky (comes with bunk beds. Staff were really friendly and helpful. Kitchen facilities good and lots of common living space, including a great garden area. Down sides: Small bathrooms and not many of them. Wasn’t much of an atmosphere with other guests. Sustainability at the expense of hospitality.